Binauralization™ — Now You Can HEAR How it Will Sound BEFORE Construction Starts! How often have you wondered what a room was going to sound like before it was built? How would it sound if the walls were parallel and not canted? Are all of the acoustical room finishes really required? Will there be echoes? Is the reverberation time too long? What will speech sound like in the room? What will music sound like? Much has been published on this subject in recent months. A major consumer loudspeaker manufacturer has developed a system to model a room with their loudspeakers. However, at Thorburn Associates, we have been working with this type of technology for over 2 years and have begun offering Binauralization™ as a service to our clients. Prior to Binauralizations™, modeling was used primarily for large and extremely critical projects such as concert halls. The only way to acoustically model a space was to build a scale model of the room. This is tedious and time consuming. To build an acoustically accurate scale model, the details, the relief, and even the construction materials must be scaled down to match the appropriate acoustical effects. Because the sound waves that we hear range from 56 feet to 2/3 of an inch in length, it is difficult to find materials that accurately scale down to 1/10 inch or 1/4 inch scale models. Unlike model building for visual aesthetics (where a red barn looks like a red barn) we can’t just paint the surfaces to create the same scaled visual look. We must also scale the acoustical characteristics of the materials used. Computer simulations allow us to address the problems of the scale in a much more effective manner. Also, unlike scale models, where complex charts and numbers are used to represent the acoustical properties of the room (Figure A), Binauralizations™ let you hear for yourself if the finished project will sound good or bad. Figure A. Complex Graphics are no longer necessary to understand the Acoustical Characteristics of a room when using Binauralizations TM. Prior to offering Binauralization™ as a service, we modeled a number of different spaces, then conducted binaural measurements once construction or retrofitting was completed. 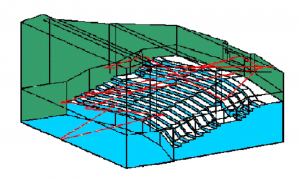 What we found is that while it is very difficult to achieve an exact model of the room, the major issues that we, as acoustical consultants, are concerned with and need to communicate to the owners and architects, are very readily apparent. So, yes, it does work! The first step in developing an acoustical simulation is identifying the finishes within the room, both in type and location. Once the physical characteristics of the model are defined, random rays are sent out from a source location. (Figure B.) These rays simulate sound waves leaving the source and traveling in the room. 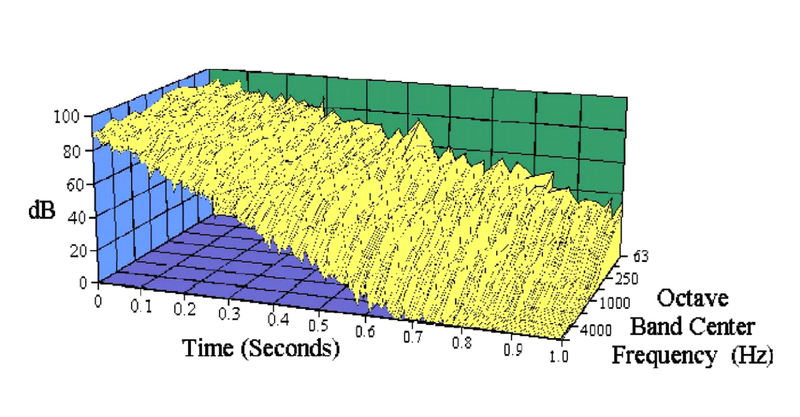 As the rays hit a surface, the computer determines how much acoustical energy is absorbed by that surface, how much energy is reflected, and in what direction. Figure B. Single Ray Tracing showing how sound is both absorbed and reflected throughout a space. This process continues until the sound ray has traveled a predetermined length of time. The longer we let the calculation go, the more accurate the model. Accuracy is also increased with the number of rays sent out. With this information in hand, we then post-process audio from a CD or tape or a recording of your own voice, and let you listen to that sound from a specific location in the room. How Can I Use Binauralizations™? After the model is built, we can readily change surface materials to allow you to hear just how bad an echo will be if we don’t treat the walls or determine if you need to have an acoustical tile ceiling, prior to construction. Binauralizations™ allow the client to make a subjective decision without relying on us to “verbalize” our recommendations in a meeting or with a report. We can model any type of facility from churches to theatres to conference rooms to lobbies to casinos to entire theme-parks! Binauralizations™ are for any project where good acoustics are necessary and bad acoustics can ruin its success! Whether you call it white noise, pink noise or NC systems, sound masking is probably the only time that an acoustical consultant will admit that some noise is good. The shift to open plan offices and demountable partitions from the traditional “private” office with gypsum board construction has created the need to raise the background sound levels in the work place (in a controlled manner) to cover over or mask distractive office noise. The trick is to determine how much noise a person can tolerate before their concentration is disturbed. Telephone conversations in adjacent spaces, copiers, printers and impromptu hallway and water cooler conferences generate disruptive noise in the work space. As discussed in a previous newsletter, when the background noise throughout an office space is uniform (not too loud, not too quiet) a worker’s perception of the acoustical isolation is significantly improved. If a particular sound is covered or masked by another noise, a person will not be able to understand the quieter sound and it will not be disturbing. A uniform background sound level can best be accomplished with a sound masking system which fills in and raises the overall noise level in the office during the quieter periods of the day. The careful design of the supply and return air diffusers systems will work for small areas. This type of system utilizes the turbulence noise generated by air flow through the diffuser. This method requires a very careful selection of the diffuser type, quantity, and locations. Very close coordination with the Mechanical Engineer, Architect, and Acoustical Consultant is required, along with an accurate knowledge of the final airflow requirements of the space to allow the selection of a diffuser with the proper airflow-to-turbulence noise rating. Install small self-contained units (noise generators) often supplied by furniture vendors or other sales representatives. Have a sound masking system designed and installed as you would any other technical system, be it electrical, mechanical or structural. All of these systems must be properly adjusted to work. System balancing and adjustment helps to minimize the intrusiveness of the system. Far too often, a system is installed then just turned on and not adjusted. Systems provided by furniture supply houses or turn key pre-manufactured systems are often the worst offender of this problem and are sold as a quick fix. These “simple” systems are often perceived by the workers as being very harsh or too loud and are usually turned off within a month of installation. However, a well designed sound masking system will have the ability to control and adjust the background noise spectrum in many different frequency or tonal ranges. The sound masking system will automatically change the volume over the course of the day, adjusting for quiet, early morning and late night hours as well as busy mid-day hours. A good masking system will also provide methods to prevent tampering or unauthorized access (computer control, security lockouts, etc.). When a sound masking system is properly installed and adjusted, the quality of the work environment is significantly improved. We frequently get calls from owners and tenants who wish to improve the sound isolation between apartments and condominiums, particularly in older units. The call often begins with, “I want something I can spray on to the wall to soundproof it so I don’t hear my neighbor’s stereo…” or “My neighbor’s snoring keeps me awake at night”. Unfortunately, just putting something on the surface of the walls will not really improve things. Sound absorbing materials only “color” the sound in the room the material is added to. Typically in a very absorptive room such as a bedroom, adding more absorption has little effect on things. Experience has shown there is only a 2 to 4 decibel change in sound levels between an unfurnished room and a completely furnished one. “But what is a 2 to 4 decibel difference?” is usually the next question. In a typical setting, the sound level would need to change by 3 decibels for you to be able to hear a change. An example of this is the change in the sound level if you are listening to two loudspeakers side-by-side and then turn one off then back on. “Okay, but isn’t there some type of minimum code requirement?” The answer here is that in 1973 the State of California adopted Title 25, which required that the minimum sound isolation across party walls and floor/ceilings in hotels, motels, condominiums, and any other dwelling area, be at least STC 50. This code has been adopted, amended, changed and is presently Title 24, Chapter 35 of the California Building Code. In case you are wondering, STC is the Sound Transmission Class of a partition. It is a single number rating system which is used to compare the sound insulating properties of different walls, floor/ceilings, doors, etc. primarily in respect to speech and small appliance noise. 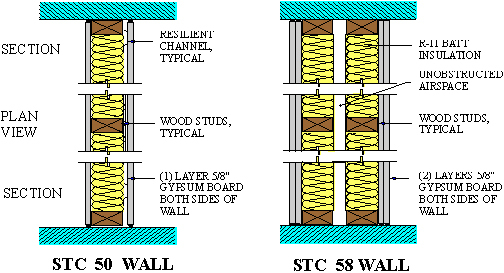 In a building the actual construction of a STC 50 partition is approximately equal to 50 decibels of sound isolation. The higher the STC number the greater the sound isolation properties of the partition. So how do we reduce the noise if sound absorbing materials don’t work? If there is no “magic” material to spray on to the walls? 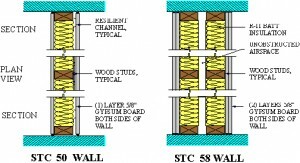 As you might have guessed, the answer is to upgrade the wall or floor/ceiling constructions to increase the STC rating of the partition. This usually involves removing the existing gypsum board, adding batt insulation, then mounting or hanging new gypsum board on resilient channels. 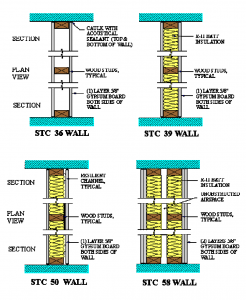 This construction has an STC 50 rating versus an uninsulated wall with an STC 35 rating. An increase of 15 STC points! (Please see diagrams.) In some cases, when it is not desired to remove the existing gypsum board, a “new” wall can be furred out from the existing wall. “But how much sound isolation is enough?” As we have discussed in recent articles this is a “signal-to-noise” issue. The quieter the background environment where you will be listening, the greater the insulating properties required to keep loud noises out. What works in an urban setting with bus and auto noise will not work in a quiet, rural area with only wind and birds. A sound masking system makes a open plan office area more functional and acceptable than it would be without it. However, any system that is not adjusted properly and is a major source of noise will be a problem. Unfortunately, this includes a sound masking system. Speech privacy (peach piracy) exists when a conversation cannot be understood even if it can be heard. There are 4 levels of speech privacy; normal, confidential, inaudibility and none. Normal speech privacy exists when someone can only partially understand the telephone conversation or the meeting in an adjacent office cubical without having to stop, listen and concentrate on the conversation. Confidential speech privacy exists when you can only hear mumbling coming from the other side of the office partition. If you can occasionally make out a word, but you cannot understand the context or intent of the conversation then the conversation is confidential. Inaudibility exists when you have no idea that a person is speaking in the adjacent room. There is no speech privacy if you can actively participate, without trying, in the conversation being held in the adjacent work station or office. So why is there always one individual on a floor or building who complains they do not have enough privacy even though their colleagues seem to be fine? This person thinks that speech from an adjacent office space (open plan or private) is obtrusive and annoying. What they are experiencing is a “signal to noise” ratio problem. The solution is to reduce the ratio for greater speech privacy. The higher the signal (speech, phone ring, etc.) over the noise (partition sound reduction plus background noise) the more intrusive the sound will be. This ratio of signal to noise varies throughout a floor or building because the building system noise, traffic noise, HVAC system noise, and office equipment noise all vary throughout the floor. It would be similar to having different areas of the floor illuminated with 25 watt bulbs, 50 watt bulbs and 100 watt bulbs. Some individuals will feel that the lighting is too bright in their area while others will feel that it is too dark. Another important factor is that the quality or type of noise has an impact on its obtrusiveness. Individuals on speaker phones or people with naturally loud or boisterous voices can be particularly irritating. A particularly boisterous worker could be quieted by a muzzle. But, while this may be an effective and inexpensive solution, it is not really practical. Improving the walls, office partition heights, and increasing background sound levels to a uniform level throughout the office space (sound masking) all significantly improve the perceived sound isolation within offices and speech is generally not as obtrusive. From an entertainment point of view there is probably nothing more impressive than going to a first run cinema (front projection) and being enveloped by the large screen and catchy plot. That’s great if the purpose is for entertainment or large scale audiences. However, if the purpose is to explain a project topic or concept, a different system may be desired. When we are giving lectures or presentations we tend to move around and interact with our slides and graphics. If we use front projection we often disrupt or block part of the image. If rear projection is used we can interact and discuss the image without causing shadows. The solution as to which is best is determined by how the client will make presentations. The following list describes the issues we discuss to determine which system is most appropriate for a project. Allows a much bigger image. Allows for Keystone correction (where the top of the image is wider than the bottom of the image, see picture below). The room lighting for front projection must be carefully designed. 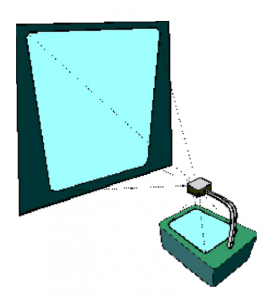 The image you view, when front projection is used, consists of light from the projector reflected off the screen. This also means any light in the room will also be reflected off the screen back to you, washing out the image (this is why a cinema is generally very, very dark). Projection equipment is often located in the same room as the screen and unless carefully coordinated creates a new source of noise, glare, distraction, etc. Allows for easy interaction with the projected image. Good for long, narrow rooms such as conference rooms. Can be viewed in a room with normal illumination. Excellent for taking notes and command center types of situations where individuals move around and are doing other activities. Generally provides a cleaner looking system installation appearance. Screen size is limited to the size of transportable glass. Space is required behind the projection screen. However, this space can be utilized as the audiovisual system equipment room. The use of mirrors can further reduce the depth requirements of the room. Rear projection systems are generally a little more expensive. Rear projection screens are slightly more expensive than front projection roll down screens and the additional cost of the square footage required for the rear projection room can be an issue. As you can see there are advantages and disadvantages to both systems and both are very effective when used properly. The key is to evaluate your clients’ needs (both current and future) and select the system that best meets those needs. Driving piles is typically considered one of the noisiest, most disruptive activities at a construction job site. The increased noise and vibration levels can disrupt ongoing client activity as well as adjacent neighbors. However, new hydraulic pile-driving equipment may change this. In a recent project to expand the paper making capacity of a Charleston, South Carolina paper plant a new foundation was required. This project became complicated when is was learned that the old, vibration-sensitive paper machine needed to remain in place and in operation for as long as possible before the equipment switch. Also, the initial work had to be completed in a space with only 12 feet of headroom. Based on these requirements the contractor decided to use steel H-Piles and contacted Ken-Jet Industries Ltd. , of Missagua, Ontario, (416) 670-2436. Ken-Jet Industries had just started distributing the Japanese-made Still Worker hydraulic piling machine in North America. The Still Worker uses hydraulics to drive piles with a smooth, fluid motion that minimizes noise and vibration. The unit operates at ground level. It grips a pile and pushes it down about 3 feet then releases. It then slides up 3 feet and grips the pile for another push. Originally, the contractor for the project figured on driving one and a half 40-foot piles per shift. After practicing with the Still Worker they were able to install 3-4 piles per shift. Different versions of the Still Worker can be used to install and extract steel H-Piles and sheet piles. The sheet piling equipment can “self travel” across the tops of installed piles. The noise generated by the Still Worker is 20 decibels quieter than Vibro Hammers (1/4 as loud) and 30 decibels quieter than a Pile Hammer (1/3 as loud). Vibration levels are 30 decibels lower than a Vibro Hammer (1/3 the vibration) and 50 decibels lower than Pile Hammers (1/10 the vibration). This process should be considered for projects in acoustically critical environments. Tech Notes: Ceiling Mounted Microphones – A Solution or a Problem? With hopes of eliminating tabletop or podium microphones, End Users, Designers and Architects frequently ask, “What about sticking them on the ceiling?” Usually, what seems like an easy solution is not the best solution. Second, the most effective distance of the microphone from the sound source must be considered. For vocal microphones in a band this distance is a few inches, for microphones in a conference room setting the optimum distance is usually 1 to 3 feet. Ceiling mounted installations will exceed this optimum distance, which allows the microphone to transmit the speaker’s voice plus other unwanted sounds in the room (HVAC noise, fluorescent light buzz, etc.). The result is poor audio quality. When can ceiling mounted microphones work? They can be used to record speech or music for an archive record, not to reinforce speech or music. They must be used in an extremely quiet room with a background noise criteria (NC) rating of no more than NC 20. Acoustical Terms – What Are They/What Do They Mean? 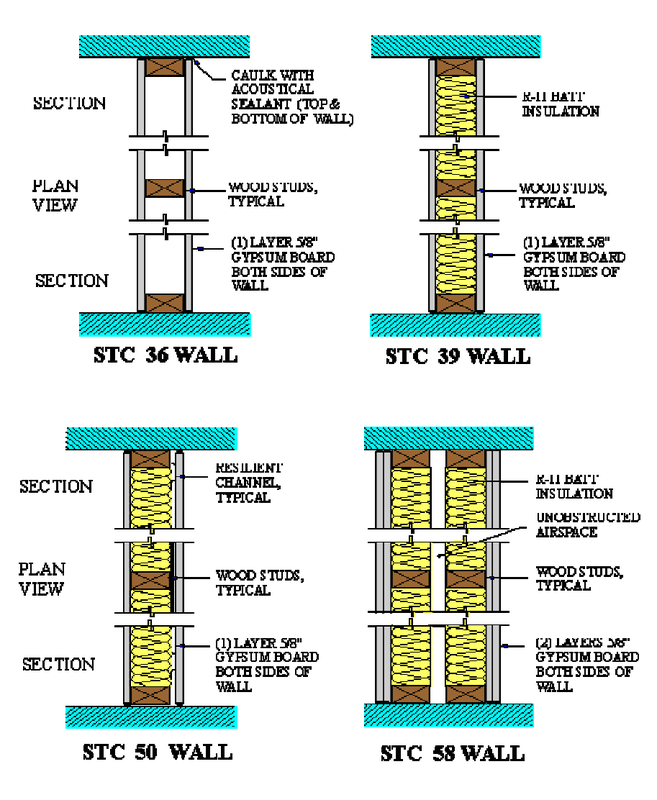 STC or Sound Transmission Class, describes how much sound a wall or a floor/ceiling construction will block from one room to the next. A good analogy to an STC rating is the fire rating of a partition. A two hour fire-rated assembly will keep the fire on the opposite side of the partition longer than a 20 minute assembly. Just like fire ratings, the higher the STC rating, the better the isolation. 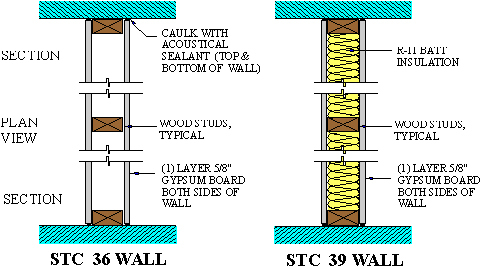 Therefore, an STC 50 partition will block more sound than an STC 30 partition. NRC or Noise Reduction Coefficient, defines how much sound specific materials absorb. This is analogous to a room’s finishes. Just as various colors of paint, or textures, visually alter a room, various materials with different NRC ratings, such as carpet or tile, audibly alter a room. A material with a low NRC rating (tile) absorbs little sound and a material with a higher NRC rating (carpet) absorbs more sound. Finally, NC or Noise Criteria measures how much mechanical noise can be heard in a room. This type of measurement can be compared to the amount of light in a room. A foot candle describes how much illumination a lighting fixture provides on a surface, NC describes how much mechanical system noise is heard in a room. The brighter the light on a surface the higher the foot candles, and the higher the NC rating, the more noise that is heard. Are STC, NRC and NC related? Not really. They do interact in the total design of a room, just as the building structure, room finishes and lighting interacts on the visual design of a space. However, individually they all play separate roles. Room finishes are independent of the fire rating of the partition, just as the amount of sound a material absorbs is independent of its ability to block sound from one room to the next. Hopefully these analogies of Sound Transmission Class to fire ratings; Noise Reduction Criteria to a room finish; and Noise Criteria to foot candles helps define and explain these acoustical terms. I want to thank you for all your assistance in getting us set up with the acoustical treatment. All in all, working with you has been a wonderful experience and I will recommend your service to anyone in a similar situation. In fact, if you would like to have people visit our center to see the work, just have them call. Of course they won’t have the dramatic impact of being here before the work was done. But I’m sure I can have staff who will attest to how great the difference is.